This false-color mosaic shows the entire hemisphere of Iapetus acquired by Cassini. The transition region between the dark leading and bright trailing hemispheres is visible along the right side of the image. Saturn'smoon Iapetus has virtually no gray. Rather, its features are all stark blackand white. The appearance has long puzzled astronomers. 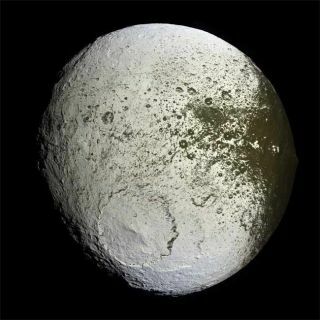 Newdetailed images suggest sunlight is melting ice on one side of Iapetus, leavingthe moon's dark surface exposed, while the opposite half retains its reflectiveice-mixed shell. Since themoon's discovery by Giovanni Domenico Cassini in 1671, Iapetus' appearance hasbaffled astronomers. The leading edge of Iapetus, which faces the direction ofits orbit, is black as asphalt, while its trailingside appears bright as snow. Iapetus is 907 miles (1,460 kilometers) wideand circles Saturn at a distance of about 2.2 million miles (3.6 millionkilometers). High-resolutionimages of Iapetus acquired last month by the Cassini-Huygens spacecraft during itslow pass over the moon have uncovered telling details on its surface that maywell yield the reason for its strange brightand dark patterns. ?Whilethere are many details yet to be worked out, we think we now understand theessence of why Iapetus looks the way it does,? said Carolyn Porco, theleader of the imaging team at the Space Science Institute in Boulder, Colo. The newobservations add support to a two-part explanation for Iapetus' appearance. First,as Iapetus treks around Saturn, itsleading edge scoops up a thin coating of dark material, which amplifiessunlight absorption. ?Dustymaterial spiraling in from outer moons hits Iapetus head-on and causes theforward-facing side of Iapetus to look different than the rest of themoon,? said Tilmann Denk, Cassini imaging scientist at the Free Universityin Germany. Over time,as the black-ish surfaces warm, the rate of evaporation increases until finallyall the surface ice in that region melts away. Infrared observations from the Cassiniflyby confirm the dark dust material is approximately -230 degrees Fahrenheit (-146degrees Celsius)--warm enough for the release of water vapor from the ice. The water vaporformed then condenses on the nearest cold spot, such as along polar regions andicy areas at lower latitudes on the trailing side of the moon. In that way, thedark material loses the mixed-in ice and gets even darker, while the brightmaterial accumulates more ice and gets brighter, in what the astronomers call arunaway process that leaves no gray area.